Warm the oil in a pot for 1 minute. Add onions and greenpepper and fry until soft with Robertsons Barbecue Spice, Robertsons Peri-Peri and curry powder. Add the grated carrots, tomatoes and baked beans and mix well. Allow the mixture to cook for 15 minutes on medium heat. Stir the mixture every 5 minutes to ensure that it does not stick, and becomes smooth. Add the Aromat and cook for another 5 minutes. Serve with wors and pap. I call this The Cheese Dip that will make you famous because it’s guaranteed to be the hit of the party! Serve it at your Super Bowl Party, serve it at a cocktail party, serve it anywhere and you’ll get rave reviews! It’s super easy, and you’ll have everyone asking for the recipe. Try it with jalapeño jack or chipotle seasonings if you like a kick…otherwise, stick to the cheddar. 2. Microwave on high for about 2 minutes or until the ingredients are melted enough to stir together. 4. Bake at 350 for 20 minutes or until lightly browned. 5. Serve with Wheat Thins or Frito’s Scoops for dipping... Or celery, my favorite! Grind through meat grinder or in food processor; tomatoes, red peppers, green peppers, and hot red peppers. Place in large kettle; add remaining ingredients and cook for 3 hours, stirring frequently to keep from burning on the bottom. Mix all the ingredients and store in refrigerator overnight. Combine fat with flour in a hot skillet, continuously stirring, cook on medium for a couple of minutes until a dark roux is formed. Add milk slowly to skillet, and mix with roux using either a whisk or wooden spoon (be sure and press out any lumps). Turn heat to low and continue stirring until mixture is thickened, a couple more minutes. Add pepper and salt to taste. If gravy is too thick for your taste, you can thin it by adding either more milk or water a tablespoon at a time. Goes great with mashed potatoes, fried chicken, biscuits, chicken fried steak, grits, vegetables, rice or anything else you can imagine. Bring 1 litre water to boil in a deep saucepan. Add washed, drained, dhal. Cover and simmer for 30-40 minutes or until dhal is mushy. Heat oil, add garlic, curry leaves, tomatoes and stir. Add all dry masala powders, salt and 2 tablespoons water. Stir and cook for a few seconds. Add cooked dhal, stir and bring to boil. Cover and simmer for 10 minutes. Remove from heat, add lemon juice. Stir well, add dhanya leaves. Serve hot with steamed rice, puris or vetbroodtjies. • Add 4 hard boiled eggs to dhal before serving. Serve with atchars. • Serve dhal with fish frikkadel or fried masala fish and blatjang. Put the vinegar in a small pan with the peppercorns and bay leaf. Reduce the vinegar over a high heat until there is only 1 tbsp left. Strain the peppercorns and the bay leaf from this reduction. Put the egg yolks in a food processor with the vinegar reduction. Gently melt the butter so that the butter solids fall to the bottom of the saucepan. Turn the food processor on and slowly pour the butter on to the egg yolks with the motor still running. The sauce will start to thicken. When only the butter solids are left, stop. If the sauce is too thick, add a little hot water. Season to taste with salt and pepper and a little lemon juice. In a medium sauce, combine oil, jalapeno peppers, garlic, onion and salt. Cook 4 minutes over high heat. Add water and cook 20 minutes, stirring often. Slowly add in vinegar while processing. Pour into a sterilized jar with a tight lid. Stays up to 3 months in the refrigerator! NOTE: Be sure to make this recipe in a well ventilated room. The fumes can be quite strong. Enjoy! TDC NOTE: It is very very hot!! First we are going to make a roux with the melted shortening and 1 1/2 tablespoon of breading flour. Cook this over low heat for 10 to 15 minutes or until the roux browns in color to resemble a nice milk chocolate color. Once the mixture turns brown remove it from the heat and add the remaining flour and slowly add the liquid(s) to incorporate it so no lumps. Bring the mixture to a boil and boil for 2 minutes reduce the heat and allow the mixture to thicken which would take about 3 to 5 minutes. Do not allow the Sauce to come to a boil as it will over cook. Use this versatile marinade to lend zesty flavor to chicken, beef, pork—even tofu or vegetables. marinade. Pat meat dry and cook as desired. Mayonnaise is one of those things we always buy at the shops and would never consider making ourselves. Either because there is a chance it can split and then what? Or because of the preconception that it is difficult to make. Let me tell you, it is as easy as anything. As long as you have all the ingredients at hand and a food processor, you’ll never buy Kraft, Cross & Blackwell or Nola again! The other brilliant thing about mayo is that with some chopped herbs, or some spices you can completely recreate it into something exceptional. Try mustard, basil, garlic, chilli, anchovy, capers…you name it! Mayo is a brilliant base for almost anything. On a sandwich or as a dip it is a win, especially when you say you made it yourself! 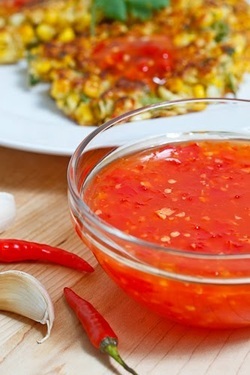 • Place all the ingredients except the oil into the bowl of a food processor and process quickly to combine. • Through the top of the food processor, while it is on, slowly pour the oil in a steady stream. • If the mayonnaise gets too thick too quickly, add a little warm water and continue. • If the mayonnaise isn’t thick enough, add some more oil. • If the mayonnaise splits, spoon it out of the food processor bowl. Place a fresh egg yolk into the food processor and add the split mayonnaise to the egg yolk a little at a time as it processes. This recipe is pretty tangy so if you like a milder mayo, put in a little less vinegar at the beginning. 1. Combine the condensed milk, 125ml of the vinegar and 30ml mustard powder in a bowl and set aside. 2. Combine mustard seeds and the rest of the vinegar in a saucepan, bring to the boil, reduce heat and simmer for about 15 minutes. 3. Beat eggs, sugar, the rest of the mustard powder, salt and cayenne pepper until sugar has dissolved completely. 4. Transfer to a double boiler and heat until thick. 5. Add the condensed milk and seed mixtures to the egg mixture, stir thoroughly to combine and heat again for 5 minutes. 6. Spoon into sterilised jars and leave to cool before sealing the bottles. To make the peri peri sauce, blend all the dry ingredients in a blender, or crush to a paste with a pestle and mortar, then mix in the wet ingredients. Use instead of tomato sauce or as a dip. Remove the skin from the onion and chop into ± 1cm square pieces. Remove the stems from the jalapeno (if using fresh) and tomatoes and chop into 1cm square pieces. Preheat the oil to medium temperature in a large frying pan. Add the onions and saute for about 10 minutes or until tender but not brown. Add the remaining ingredients. Turn heat to medium-low and simmer for about 10 minutes. For a less spicy sauce, keep the jalapeno whole and remove it after simmering the mixture. 1/8 teaspoon Ground cayenne pepper; OPTIONAL!!! Preheat a flat grill or large frying pan over medium-high heat. Sprinkle some of the seasoning blend over both sides of each cut of beef. Grill the steaks on each side to your desired level of doneness. Be sure to use tongs to sear all the edges of each steak to a rich brown color. This recipe yields about 8 teaspoons of seasoning. I recommend making serving and trying it out. If you like it, make a large batch and keep it in a container. 1. Puree the chilies and garlic in a food processor. 2. Bring the water, vinegar, sugar, salt, chilies and garlic to a boil and simmer for the chilies and garlic begin to get tender, about 3 minutes. 3. Mix the cornstarch into the water, mix it into the sauce and heat until the sauce thickens, about a minute. 4. Let cool and enjoy. Stir the mayonnaise, relish, mustard, and lemon juice together in a bowl. "Simple tartar sauce for deep fried seafood. It is better if prepared several hours before you will be using it, but it can be used immediately. Store for up to 3 days in the refrigerator." In a small bowl, mix together mayonnaise, sweet pickle relish, and minced onion. Tartare sauce is a variation of mayonnaise. It is often used to jazz up seafood. Combine egg yolks and mustard in a bowl. Gradually add oil in a thin stream, whisking constantly until thickened. Add vinegar, gherkins, capers, parsley and lemon juice. "My mother and I always judge a seafood restaurant by their tartar sauce. Stir together the mayonnaise, pickles, egg, shallot, capers, tarragon, mustard, parsley, and lemon juice in a bowl. Refrigerate 4 to 8 hours before serving. 1.Starting with fresh, fleshy peppers at the peak of ripeness. Chances are that you won’t have all your peppers ripening at exactly the same time and there’s no harm in throwing a green one or two into the mix. 2.You’ll want to chop off the green stems. If you’re not wearing gloves, be careful not to touch your eyes afterward. 3.Grind the peppers into a medium to fine mash with a food processor or blender. 4.Salt does two important things: it helps pull water from peppers (think about what happens when you salt a cucumber) and enhances their flavor. The ratio of mashed peppers to salt is not an exact science, but 30:1 should work for most peppers. Mix the salt in with the mash and pack it down to the bottom of your container. As the water seeps out it should cover the mash and prevent it from being exposed to the air. If you're not pulling enough water out to do this, you can add some salted water to your container to cover the mash. 4.You’ll want to let your peppers ferment for at least a month to allow the flavor to become more complex and interesting. Store your crock at room temperature and be cover it with a clean dishtowel to keep out dust. Check on it from time to time to make sure that there is liquid covering the mash. After aging is finished, place your mash in a new clean and sterilized container. Add white wine vinegar to taste and age for about another week to allow the flavors to blend together. 5.Straining your sauce allows you to remove the seeds and create a smooth, pourable texture. If you don’t have a foodmill or strainer you can pour your vinegar mash mixture into a bowl lined with cheesecloth, fold the cheesecloth up into a ball and twist & squeeze until the juice is extracted. The original Tabasco sauce is quite liquid, but I like mine with some pulp. 6.Your homegrown hot sauce should easily keep for several months, but it’s so good that I doubt it will last that long. NB: I do not use salt or sugar to this mix until the end of cooking time. This is due the fact I'm using chutney and soup powder..
Braise onions, brinjels, garlic, spices an green-pepper with olive oil till nice and tender..
Once all blended and cooked through to a pulp, add the tinned tomatoes and allow this to cook through, BE CAREFUL FOR IT TO BURN..
Lastly add good dose of chutney to sauce and about 500ml water and let it simmer..
Now depending on what consistancy you want: THICK - add pack of tomato/spicy tomato soup to thicken.. or add more water if too thick. Cool down completely and put into required portions and freeze as needed.